. : Optics & Photonics Focus :: Light from the Darkest Planet :. Many cancer patients do not respond to chemotherapy and have to endure harmful side effects even when the treatment itself does not prove effective. A new technique could, as of the very first day, give the green or red light to continuing with the treatment. Scared of needles? Fear no more! A new injection technique could make the needle obsolete by replacing it with a flash of light. Just as detectives can only guess what mafia clans discuss inside their hideout, scientists usually only have indirect access to the behavior of trapped ultracold atomic gases. A novel technique permits one to directly observe them inside the trap. The different colors reflected by carrots, green leaf salad, or even blueberries, give us clues as to their composition. Interestingly, the composition of exoplanets can also be inferred from their reflected light. 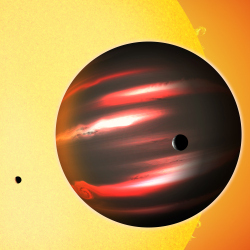 But, what if a planet is far darker than we had ever thought possible? Little escape for light. Artistic conception of TrES-2, a Jupiter-sized gas giant that reflects less than one percent of the incident light and is, therefore, darker than acrylic paint or coal. Picture credit: David A. Aguilar (CfA). Since 2006, the Kepler space telescope has been looking at a part of the Milky Way, searching for potentially habitable, Earth-like planets in other solar systems. The massive amount of data delivered by the Kepler mission has already led to the discovery of several extra-solar planets, or exoplanets, and nurtured the curiosity regarding the composition of these objects. Analyzing this data, David M. Kipping from Harvard University and David S. Spiegel from Princeton University have found an exoplanet that is unusually dark — darker, in fact, than coal or acrylic paint, and thus significantly darker than what would be expected for a planet. Kipping and Spiegel’s research illustrates the unprecedented accuracy of space-borne telescopes and leaves scientists puzzled with respect to the composition of TrES-2, the planet in question. People have always gazed at the heavens, where the stars have always held an undeniable fascination. The development of a space telescope like Kepler, therefore, comes to represent the culmination of millennia of awe and research. Astronomy is the oldest natural science, known to the most ancient civilizations in recorded history (going back around five thousand years). Observation of the stars has traditionally been of key importance to countless religious ceremonies and rituals. Sophisticated optical tools to study the stars, however, did not appear until the early 17th century, when the telescope set off a profound scientific revolution involving many of the great names in science. The first known telescopes appeared in the Netherlands around the year 1608 and basically consisted of a long tube with a number of refracting lenses. One year later, in 1609, the Italian scientist Galileo Galilei heard about the "Dutch perspective glass" and readily adapted its design to make his own, improved telescope, which allowed him to observe the phases of Venus, and also the largest satellites of Jupiter. Galileo's German contemporary, Johannes Kepler, built a yet improved telescope and further advanced the ongoing scientific revolution. Many other great scientists, like Dutchman Christiaan Huygens and, most notably, Englishman Sir Isaac Newton, also contributed to astronomy and the refinement of telescopes, with Newton building the first practical reflecting telescope in 1668. Telescope design continued to undergo refinement over the following decades and centuries, while the lens fabrication process was improved, in particular with respect to chromatic aberrations. Telescopes harnessing invisible parts of the electro-magnetic spectrum, such as radio waves, became available in the 20th century, and they came to complement visible light telescopes. Space-borne telescopes were introduced in the late 1960s. They avoid atmospheric scattering, absorption and turbulence, and they are able to produce images of unprecedented resolution and accuracy. In addition, space telescopes significantly enhanced the portion of the electromagnetic spectrum that is accessible to astronomers, and they can now detect ultra-violet, as well as infrared radiation, in addition to gamma rays and x-rays. The Kepler space telescope is not merely a simple improvement on the resolution of previous generations of telescopes; it is an entirely different tool used to study a different class of objects: namely, non-luminous exoplanets, as opposed to bright stars. In essence, Kepler continuously measures the brightness of some 145,000 stars with enormous accuracy. Planets are detected indirectly, when they periodically cover light from the host star and reflect it to the space telescope. Thus, Kepler observes a comparably large portion of space, focusing on planets in our galaxy relatively close to Earth. Most other space telescopes, such as the Hubble, focus on ever more distant stars and they specialize in imaging tiny regions of space with the best possible resolution and light sensitivity. Despite the centuries of development since the first ground-based telescopes, the basic geometry of visible light space telescopes is somewhat similar to that of Netwon's reflecting telescope: a reflector collecting as much light as possible and then concentrating it on a small area packed with photodetectors. In order to ensure the transfer of the enormous amounts of data collected by Kepler, special high-speed data links are required, and the data is made publicly available to ensure that as many scientists as possible are able to analyze the different portions of that data. In their study, Kipping and Spiegel analyzed the brightness fluctuations of a known exoplanet, TrES-2, based on publicly available Kepler data and found that this planet is far more absorptive than expected. In fact, the brightness fluctuations of the planet orbiting its host star allowed them to deduce the reflection coefficient, called albedo, as well as the color spectrum of the exoplanet. "Some materials," Kipping says, "do possess an albedo this dark but they are not expected to be found in this type planet’s atmosphere. Other materials, such as sodium and potassium, are both dark and one would expect to find them in exoplanet atmospheres, but we would require an overabundance of such chemicals to explain quite how dark this world is. So it is possible that there is some unusual chemistry going on here, which we have not seen before." "TrES-2 is not a habitable planet like ours, made of rock, soil, water and ice, but a gas giant, like Jupiter," says Giovanna Tinetti from University College London (UK). Also, she explains, the planet is far hotter than ours, due to its close proximity to its host star. Therefore, no organism as we know it would survive in these conditions, and Kepler’s search for habitable planets still goes on. "What I like about Kipping and Spiegel’s research," she continues, "is that, not only does it display Kepler’s tremendous capabilities, but it has even found an interesting element about this exoplanet that we genuinely do not yet understand. Why is this planet so dark? Maybe we will be able to learn something new about the chemistry of exoplanets." Kipping agrees that we might soon discover some exotic high-temperature chemistry. In fact, according to Kipping, this would be far from surprising because labs, even the most advanced ones, rarely reproduce temperatures as high as the ones found on planet TrES-2: 2200K. "What fascinates me is that we are able to push the limits of what we can learn about these distant planets," Kipping concludes. "This planet is 750 light years away from us and its host star is so faint that you cannot even see it with the naked eye. The planet is invisible to us, and we only detected it because it blocks out some of the light of its star during an eclipse. Yet, despite these challenges, we are able to measure the reflectivity of this alien world. The amount of light we detected is equivalent to that emitted by traffic lights placed at the same distance from Earth to the Moon, and this serves to highlight the extraordinary engineering and design of the Kepler spacecraft. Astronomy feels like Sherlock Holmes detective work. We have limited clues, tiny whispers hinting at the planet's nature. The light we detect has encoded within it vast amounts of information about the planet, and our job is to use our minds to think of ways to seek out this information. Nature is a surprise to us every day and the Universe is more diverse than we can imagine." AN is a SU2P Research Fellow working on quantum networks at Stanford University, California, USA. David M. Kipping & David S. Spiegel, Detection of visible light from the darkest world, Monthly Notices of the Royal Astronomical Society (2011) 417, L88–L92 (link).